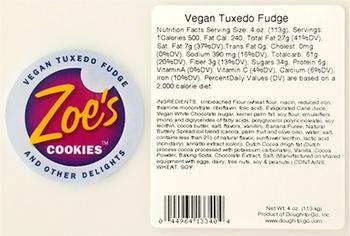 Dough-to-Go of Santa Clara, Calif., is recalling 20 cases of Zoe's Vegan Tuxedo Fudge cookies. There has been one reported case of an allergic reaction to the walnuts to date. The recalled product is a 4-oz. vegan tuxedo fudge chocolate cookie that is individually wrapped with the Zoe’s brand name and flavor label on the front and the nutritional information and ingredient listing on the back. These cookies are packed 24 to a case and sold with a product label and production code on the outside container and sold in the San Francisco Bay Area. The UPC number on the cookie label is 044964133404 and the lot code of the cases in question is 222620. Consumers with questions may contact Dough-to-Go at (800) 220-2339, Monday through Friday, 8:00am to 4:00pm (PST).